Critics will have a field day with “Burnt,” and I can understand why. John Wells has crafted a movie that is by-the numbers boring, in a style that’s safe but sleek. And there seems to be nothing underneath it all. But I will join the dissenters. I liked this movie – quite a lot, actually, if I may be honest. 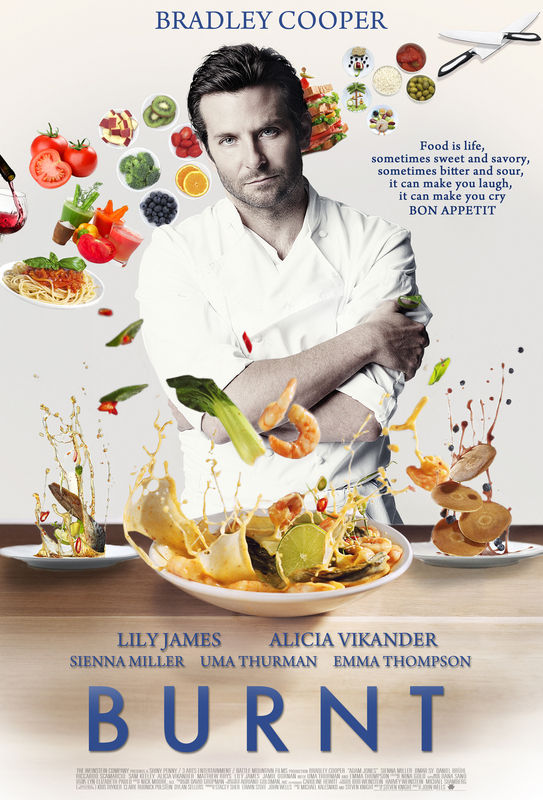 Bradley Cooper plays a bad boy chef starting over after a burnout in Paris a couple of years back. (He gave himself a penance of shucking a million oysters, literally, in New Orleans) He goes to London, hits up an old friend, Little Tony, and sneakily gets situated in a new restaurant, assembling his old crew, and mentoring a new one, Helene (Sienna Miller) We can kind of tell where all of this ends up, but the getting there was kind of fun. Cooper is tops at these kinds of roles – menacing at his meltdowns, and unleashing the charm offensive with a twinkle in his eye. I fell in love with him about five times here, and it makes sense that there is a small reveal that the character of Little Tony is a gay man who has unrequited love for him. I mean, he, like, speaks French and all. the film has a great supporting cast, with heavy hitters liek Emma Thompson, Uma Thurman with small but important roles. Some people note that Cooper has more or less played the same character in the television show “Kitchen Confidential” a few years back, and maybe that’s why he is so effective. I also saw an interview of him where he says he confesses to be a foodie so you can sense he has a great affinity for this role. All of this makes the film a great watch, never mind that you feel what you are watching may no be innovative and fresh.